Justice Adrian Saunders was appointed to the JLSC in accordance with section 105(1)(d). 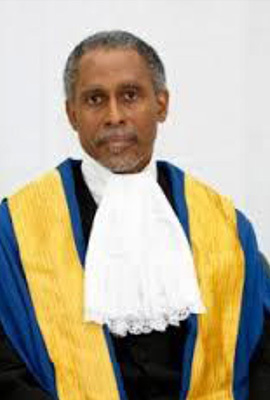 Justice Adrian Saunders was born in Saint Vincent – in the State of Saint Vincent and the Grenadines. His pursuit of a career in law led him to the Cave Hill Campus of the University of the West Indies, where he excelled and completed his studies with honours. He then went on to study for the Certificate in Legal Education at the Hugh Wooding Law School in Trinidad. Following his course of studies he returned to Saint Vincent, where he later headed the law firm of Saunders and Huggins, which became one of the most respected firms in the country. During this time, he also engaged in leadership roles, in civil roles and also participated in table tennis competitions in the region. As a lawyer, his leadership role was not limited to Saint Vincent and the Grenadines Bar, but also as a member of the Organisation of Eastern Caribbean States. He undertook some very important responsibilities, and developed the high respect of his colleagues in the region. Justice Adrian Saunders served as an Acting High Court Judge of the Eastern Caribbean Supreme Court, assigned to the Dependent Territories of Montserrat and Anguilla, during September to December 1996. He was confirmed as a High Court Judge on 1st January 1997, and was elevated to the Court of Appeal 1st May 2003. Upon the departure of the Right Hon. Sir Dennis Byron, Justice Saunders assumed the role of Acting Chief Justice. He held this position from June 2004 to February 2005, and terminated his tenure of office with the Eastern Caribbean Supreme Court on 31st March 2005. Justice Saunders has served as a Judge of the Caribbean Court of Justice (CCJ) since 2005 and has been appointed president of the CCJ with effect from 4 July 2018. Justice Saunders has been appointed to serve as a member from 1 August 2016 - 31 July 2020.